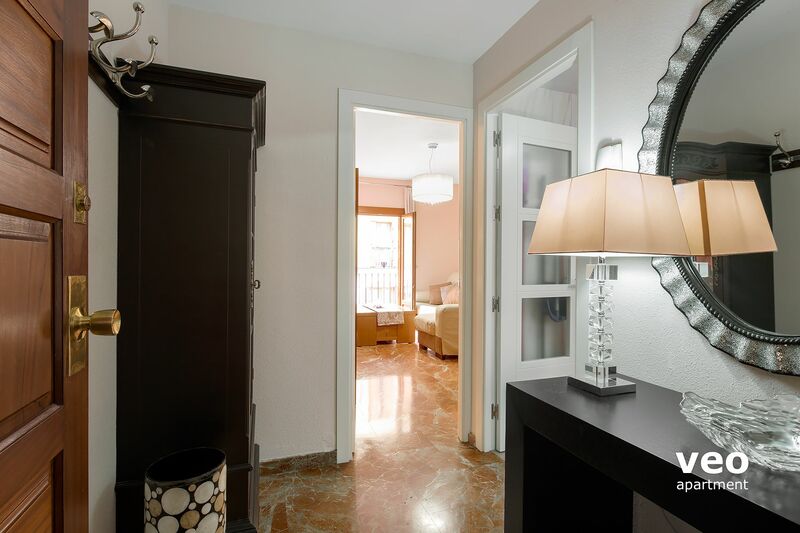 Three bedroom apartment located in the heart of Santa Cruz quarter. All rooms have french windows with julienne balconies facing the courtyard of the house - allowing plenty of light and making it a quiet place to stay. There are 3 bedrooms for six guests. One twin bedroom and two double bedrooms. All rooms have a wardrobe for storing your belongings. There are two bathrooms complete with bathtub. Other features: high speed fiber optic internet connection (100 Mbps) and central air-conditioning with cooling and heating. Private parking garage located at 160 m from the apartment: Daily rate: 14 EUR. 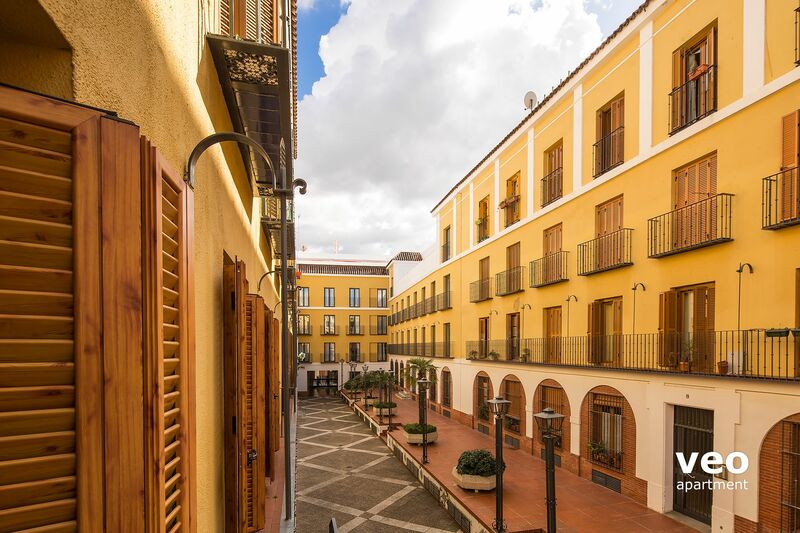 The apartment enjoys a wonderful central location within Seville's old quarter, close to the main sights and monuments: Cathedral and La Giralda, Alcázar Royal Palace and Archive of the Indies. 14:00 - 21:00. Late check-ins from 21:00 to 24:00 have an additional charge of 20 EUR. Early check-in is possible but subject to availability - please enquire. Daily rate: 14 EUR. Private parking garage, located at 160 m from the apartment. 2.10m height. Reservation by email required. Internet: Free! High speed fiber optic internet connection (100 Mbps). Baby cot: Free! A baby high chair is available, as well. Please request on your booking form. This apartment is located on a quiet residential building. It is STRICTLY PROHIBITED to make noise or parties. Apartamento muy bonito, práctico y funcional y con una tranquilidad para descansar impresionante. A en el barrio de Santa Cruz con todo lo necesario justo al lado y lo mejor a dos minutos de la Giralda y el Alquezar, sin ninguna duda recomendable al 100%. "Perfect Apartment for Three to Four Adults"
The location, the cleanliness and sizing was perfect for us four senior ladies. We could walk around and not feel intimated. This area is great for eating establishments and local shopping was made so easy. Breakfast was prepared in the kitchen at our leisure which certainly made it easy with groceries around the corner to pick up all that was required. "Nice apartment in great location." Apartment was comfortable and well equipped. Everyone one at Veo was helpful. Apartamento muy bien situado y a la vez tranquilo. Camas muy cómodas y en general bien equipado. El que tenga dos cuartos de baño facilita mucho las cosas. Y a un precio bastante asequible. Por eso considero que la relación calidad-precio es excelente. "The best apartment our family stayed in during our 5 week holiday." Everything described in the website was 100% correct. Location was brilliant! The apartment was well equipped with everything we needed and the owner was their at the appointed time and very helpful with providing information on questions we asked. The owner was well organised and had compiled a folder with very useful information on transport, restaurants, tourist sites, taxis and emergency contact numbers. This apartment was perfectly located for our week of walking around Seville. Rosa made check-in easy and was very helpful during our stay - offering suggestions and arranging a taxi for our departure. While the living room is quite small for a 3 bedroom apt., it was comfortable. The beds were comfortable and the kitchen had everything we needed. Rosa was very cordial and solicitous. The apartment had everything we needed and was very convenient. We liked that most of our neighbors were Spaniards. We had a terrific time. I am going to miss being able to nip down to the plaza for cafe con leche and chocolate croissants. "Great apartment in a terrific location." 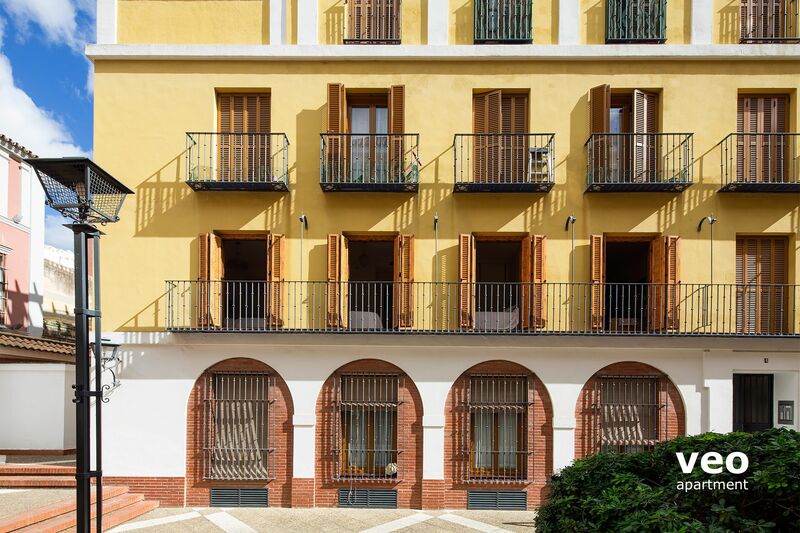 We felt as though we were living with the locals in a gated apartment block within the fantastic Jewish quarter of Seville. In fact, I wouldn't wouldn't stay in any other area. We were met by the owner at the designated time and place in front of the apartment block. She was incredibly helpful. The apartment had 3 bedrooms and two bathrooms. It was well appointed with everything you need. Perfect for 4 people, cosy for 6 people. The wives loved the washing machine and the rooftop clothes line. "Brilliant, cosy and quiet appartment in the middle of Santa Cruz"
The apartment is very cozy and confortable and stylish at the same time. Just to make you feel like home. It possesses everything you need - fully equipped kitchen, bathrooms with towels and hairdryer, even an electric iron and well working wifi and air conditioning. The place is just brilliant. It is placed in the center of Santa Cruz. However, the place is very quiet due to all windows show to a small and nice courtyard. The Veoapartment-Team and landowners provide a very good contact and service in very good English. "Beautiful appartment in a great location"
The appartment is just like the pictures and in a great central location. Rosa and her husband is great and provide very good and detailed information when you arrive. I highly recommend this apartment. We stayed one week in this centrally located apartment,and it was great.We were four adults and one baby. Rosa welcomed us and explained everything to us. The apartment is at walking distance of practically all sights,so no need to rent a car.Rosa provided a comfortable baby cot and a high chair. The apartment is well equipped. The courtyard is calm.A small adjustment to be made on hot/cold water otherwise I highly recommend. "Wonderful location and great place to stay with a family!" Rosa was fantastic in helping us get settled when we arrived. The parking garage was a great asset and I am glad we opted to take the private spot. There were 5 of us (3 kids and my husband and I), and we found the apartment to be perfect to fit our needs. We were able to cook when we wanted, and the location was great to go out. Rosa - thank you again for all of your help! We will definitely recommend the apartment to our friends and colleagues in their travels! "Great Apartment with all needed amenities "
Appartement très agréable, bien placé dans le centre historique de Séville. Parking à 2mn à pied. Très propre, calme, climatisé, bien équipé. Literie confortable. Seul inconvénient : l'eau chaude des douches très difficile à régler. Il nous est arrivé de n'avoir que de l'eau froide. Bonjour, tout d'abord nous souhaitons vous remercier pour votre commentaire. L'avis de nos clients est très important pour nous. Nous avons vérifié le chauffe-eau qui avait dû être déréglé. Tout fonctionne désormais. Si un problème survient dans l'appartement n'hésitez pas à nous contacter afin que nous puissions vous apporter une solution rapide. Notre agence à Seville est ouverte 7j/7. We enjoyed our stay in the nice and cosy apartment. Comfy beds, well-appointed kitchen. Lounge room a little small considering there are 3 double rooms but fine for a holiday stay. Check in was very smooth and easy. Good location, close to city center. Very clean and well mentained with all we needed for our stay. Veoapartment's reply: Thank you very much for your comments. We're happy you enjoyed your stay in Seville and in the apartment. Regarding TV, usually the apartments in Spain do not have English speaking TV channels, but you have to possibility to change the language of the movies/series into original version (usually in English). Stayed here with a party of 3. One room each was very relaxing. The location is excellent and it was quiet (for a big city). Not big, by any measures, so with more than 3/4 persons it might veel cramped. But you are out and about most of the time and location is excellent for seeing all the sights. "The stay in your apartment was perfect in every way." Rosa who met us and showed us around the apartment was amazing and so helpful and gave us all the information needed. She should be congratulated. 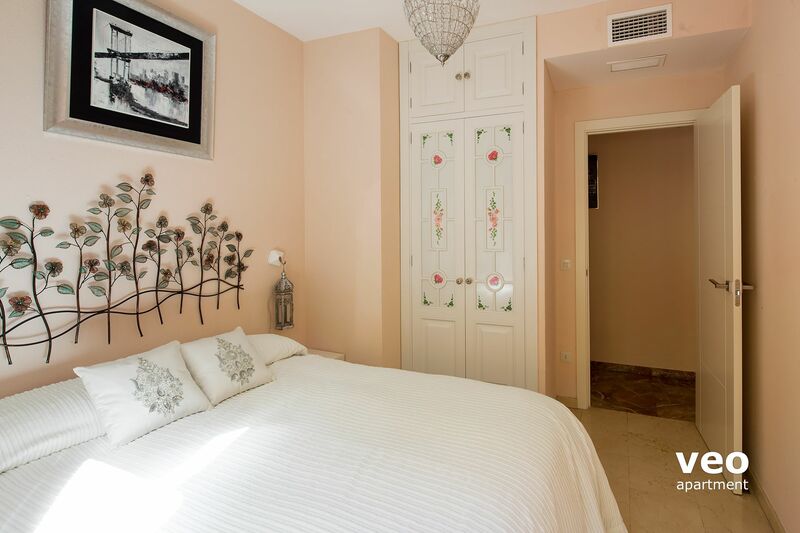 The apartment is situated perfectly to visit the wonderful city centre of Seville. It was clean and very comfortable and had all that was needed for a great holiday. 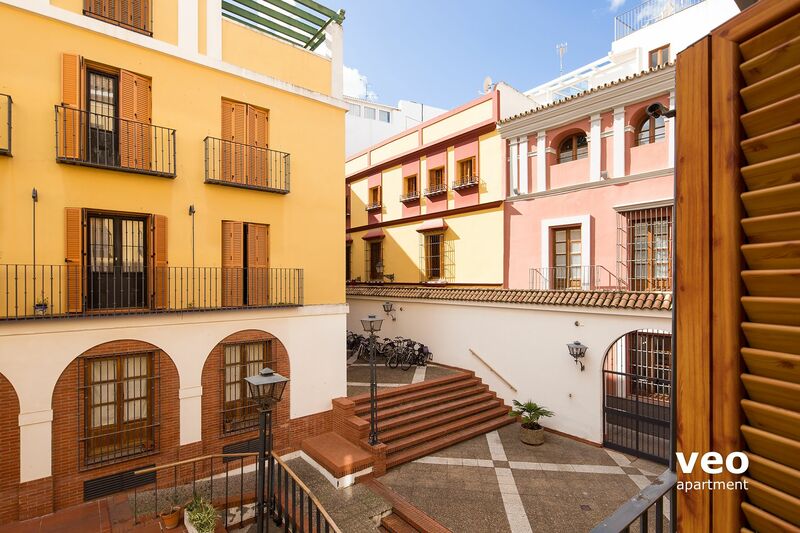 "Nice apartment in a central neighborhood"
the apartment is located in the heart of Seville, where we could walk around the Barrio of Santa Cruz everyday and walked to all the restaurants and the interested places of Seville. Rosa and her husband were very nice and helpful with all informations we needed. This is the best apartment in all 4 apartments we stayed in Spain in term of interior decoration and comfort. It was so comfortable that we even thought that the apartment was built, decorated and prepared for the owners to live first, then they moved to a better place and rented it out. 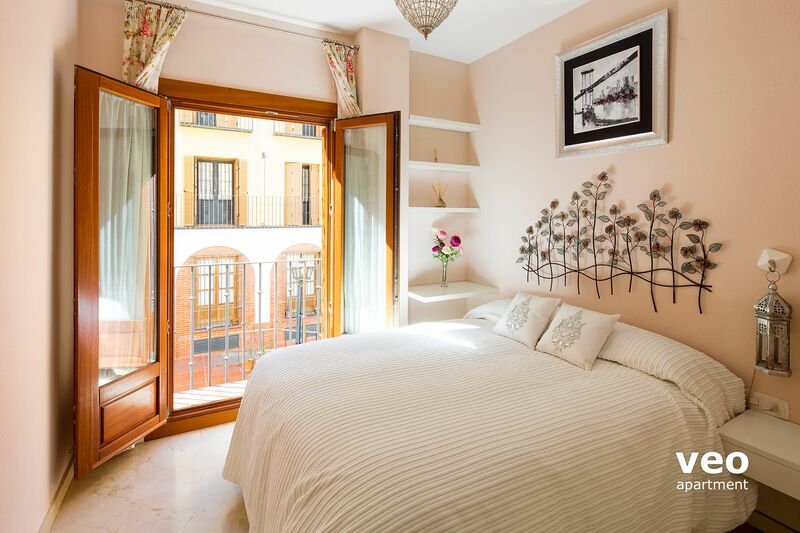 I would recommend this apartment if you need a stay in Seville. Loved this place, especially the location. Rosa met us there with keys and gave us some good tips on what to do in Sevilla, and showed us how everything worked. She was great. The apartment itself is super quiet, despite being in the middle of the action. We would definitely book this again. "Brilliant location, lovely flat. " Lovely comfortable flat in great location. "Qu'exiger de plus quand entre amis nous nous retrouvions dans cet appartement ?... Rien"
nous avons apprécié le confort, la décoration, et surtout l'accueil des propriétaires. Merci à eux. "Très bonnes prestations et emplacement idéal"
très bien situé au cur du quartier de Santa Cruz, près de la puerte de la carne et des jardins de Morillos , à 5 mn de la cathédrale. "Appartement très bien situé, calme"
Nous avions choisi cet appartement pour sa localisation, au coeur du quartier Santa Cruz, ce qui nous a permis de faire tout à pied ! Nous étions 3, chacune avait sa chambre, la cuisine est très bien équipée, seul petit bémol, le séjour/ salle à manger est un peu petit, à 3 c'était parfait mais au delà ce doit être un peu juste ...mais l'on vit plutôt dehors à Séville !! Excellent accueil de Rosa et son mari, les propriétaires. Ubicación excelente, dueños encantadores, WIFI muy buena y mucho espacio (especialmente para una familia con dos hijos de 14 y 16 años!) No creo que hay mejor localización que donde se encuentra este apartmento. I highly recommend it to travellers wishing to stay in Sevilla's most beautiful quarter. Steps away from the Cathedral and the Alcazar in the historic Jewish quarter, it is a walk away from some of the most astounding sites in this great city. Highly recommended! 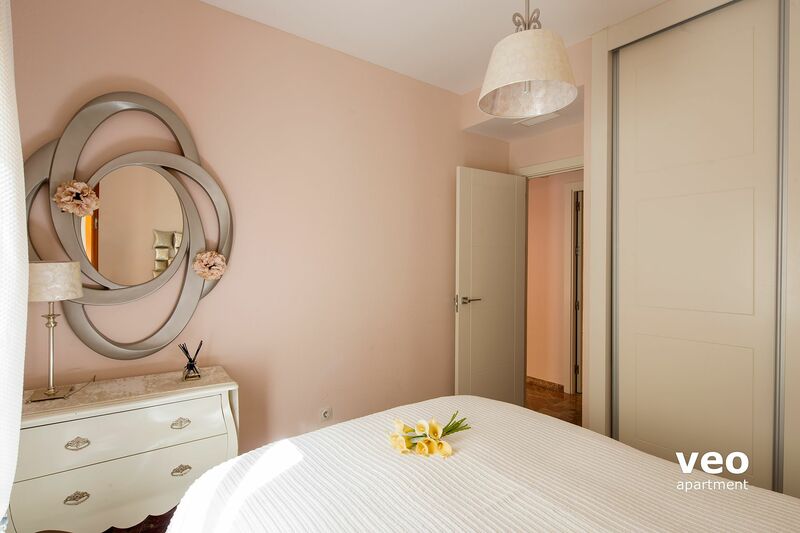 The apartment is newly renovated and stylishly decorated. The kitchen was well-stocked with basics like dish soap and extra trash bags. We were very comfortable and it was quiet. The location is perfect, very close to the cathedral. The owner greeted us very warmly and when we left an item she very graciously had it sent back to us. "Great location - and quiet!" This apartment is just as described by veoapartment and other guests - beautifully clean, fittings in very good condition, unbelievably central but quiet for its location, most helpful hosts. Only downsides are little niggles rather than complaints and have already been mentioned by others: wifi not to be relied on for anything other than phone access, and the overcrowded living area - was a real squash with four adults for sitting as well as eating. Maybe the shelving unit could be removed?? - didn't seem to serve much useful or decorative purpose, and its removal might make just enough space to allow four adults round the table without turning into a contortionist... That said, we had a great time, thank you! Veoapartment: The internet had been shared, and was sometines slow, in the past. Since Nov 2014, the apartment is equipped with its own ADSL modem, and it works very well. Connection either wireless, or by network cable. Excellent apartment in ideal location. 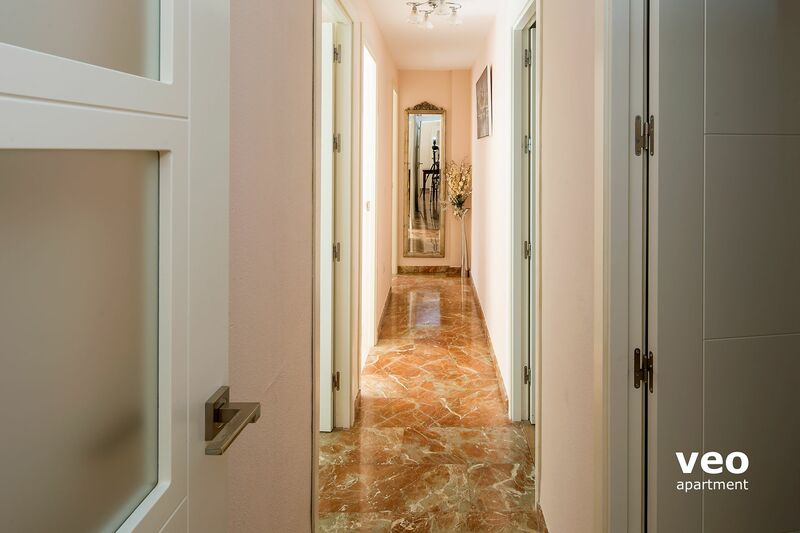 Very modern well equipped apartment in secure private building. Situated in the old quarter of the city and only a few minutes walk from restaurants and all the attractions of the city. The owners were waiting to meet us and explained everything we needed to know about the flat. There was a slight problem with the hot water system which the owners know about and hopefully will be getting it repaired. I would definitely recommend this apartment. Propre, bien situé dans la ville, tranquille. Mais gros problèmes avec l eau chaude ! Et aussi n avions pas pris garde de la grandeur des lits. Car 1m40 trop petit pour 2 adultes ! Plutôt conseillé pour une famille et non pour un groupe d adultes. Vermieter sehr freundlich! Auch ohne umfassende fremdsprachliche Kenntnisse. Lobenswert, das Apartment wegen spätem Rückflug länger genutzt werden konnte. Gute Tipps für Restaurant, Shopping und Kultur. Location perfekt dafür. Wir wollen sehr gern wieder das Apartment buchen. Die Website Fotos der Räume erweckten bei uns einen größeren Eindruck als die Realität. Aufenthalt mit 4 Personen ist in Ordnung. Location of this 3 bedroom apartment was the main highlight. Owners were also very prompt (at key drop off), friendly, and informative. Bedrooms were very clean and spacious (we are a family of 5 people). Although it had a washing machine, it was malfunctioning so we didnt get to use it. Also, no dryer even if we had a washing machine. Clothes rack is located up on the roof for sink washed clothes. Market for basic water, juice...etc is within 5 minutes walk. You are located in a very good area of windy twisty streets full of restaurants and bars. Very safe for walking late into the early morning hours as well. Great stay! Nous avons séjourné 4 nuits à 4 dans cet appartement. Appartement très bien situé au coeur de santa cruz, très bien équipé, très propre avec un très bon accueil. Un petit bémol tout de même avec l'eau chaude, mauvais réglage du chauffe eau probablement, car un coup froid, un coup chaud... on évitait donc d'utiliser les 2 douches à la fois.
" A perfect few days in Seville"
The apartment was very well situated in Santa Cruz - convenient and yet quiet. It was immaculate, imaginatively decorated and well laid out. Rosa and Fernando saw us through the procedure for parking and briefed us on local facilities - including old fashioned barber don Paco nearby. The chance of washing clothes and drying them on the roof was a great advantage as we were half way through a long holiday. Thank you to all concerned. "Appartement agréable et bien situé"
Et situe dans un endroit très calme à deux pas des bains maures. "Comfort in a great location"
This small, modern apartment suited us (four adults) very well. It was clean and well equipped. 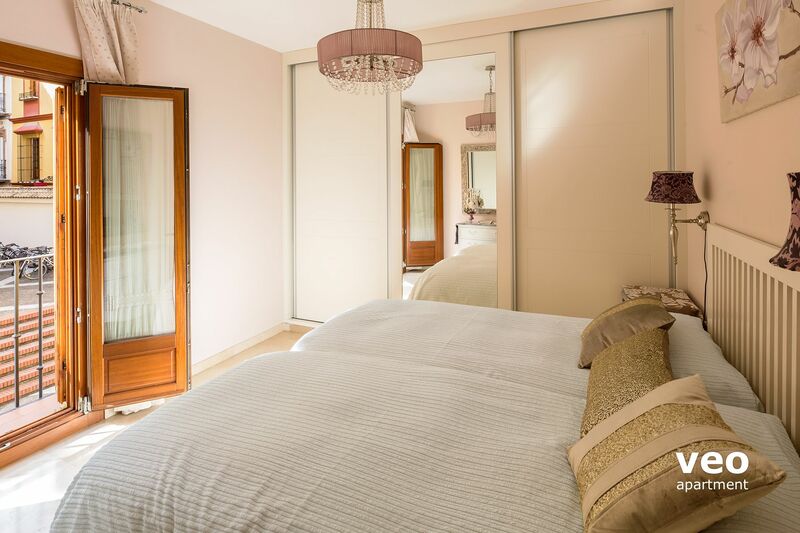 One twin bedroom and two smaller ones. Bathrooms well fitted out and plenty of towels. Kitchen had all we needed. The location is really excellent. We easily walked to the main attractions and there were small shops nearby and plenty of eating places. Taxi rank close by. Would definitely stay there again. "Appartement propre, coquet, confortable et, surtout, situation parfaite." Tout est très bien pour ce qui concerne l'appartement lui même. De plus l'accueil par Rosa et Fernando est chaleureux et toujours ponctuel. Leur place de parking est très bien située et très facile d'accès. Réservation très facile, contact avec le propriétaire également. 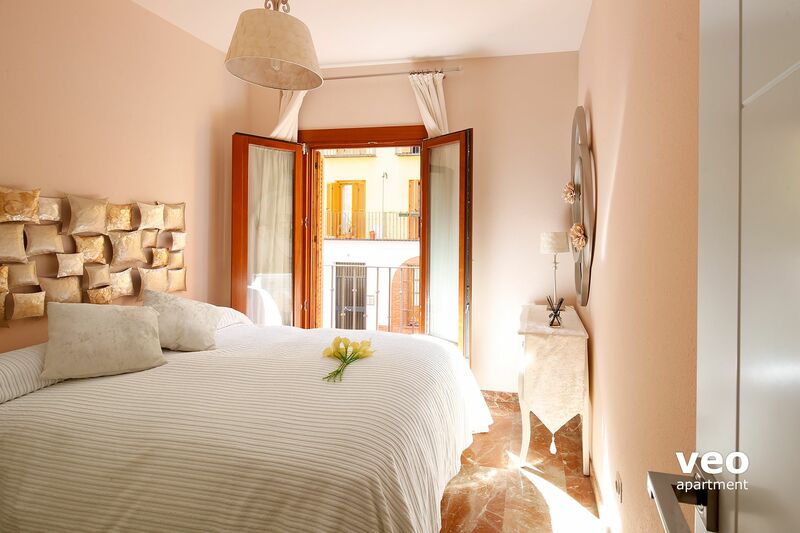 "The location of this comfortable apartment is superb -- right in the heart of the old town, near the Alcazar and the Cathedral and 20 steps from a terrific Flamenco show." 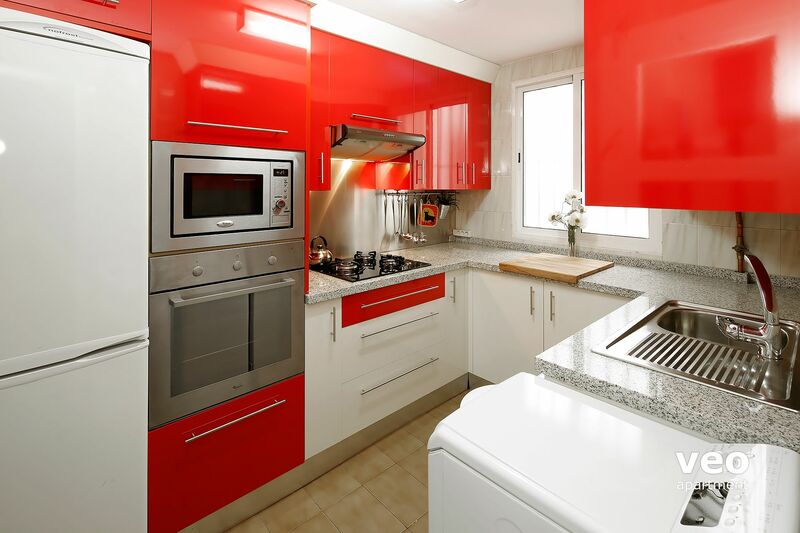 The ladies loved the fully equipped red kitchen and everyone found the bedrooms ample sized and quite comfortable. The location of the Ximenenz de Encisco could not be better for sightseeing. The manager Rosa who met us was very helpful and friendly. By staying in this apartment, we saved a great deal on meals. The cost of groceries in Seville is quite reasonable while restaurant prices are rather high. We loved the option of preparing several meals at our Seville home. We do have some suggestions to further improve the apartment. The overstuffed sofa in the living room has to go. It is much too big for the space and makes it difficult for four people to share a meal. It was a mistake to obtain such a huge piece of furniture. Six people eating together would have a real problem! The wall furnishings are rather dreary. A few colorful prints would make the apartment more cheerful. The apartment does have a kettle and nice pots and pans. However a coffee maker would be a fine addition. The apartment is in a great location - in the old city and easy walking distance to everything. Rosa and her husband were wonderful - they had excellent information about the local area, helped us with directions and gave suggestions on places to eat. They were very accommodating and even walked down the road with us to show us things. The apartment is well equipped - great kitchen and very comfortable beds. As we were there in winter we apprectated the excellent heating and hot water. The only downside was the internet - a poor connection and very slow - pages would often time out before loading. Coming from Australia we loved being able to hang our washing outside in the sun! We really enjoyed our stay. "Great location, great place, great time!" The location was very convenient for walking throughout the city center, but in a quiet location. The apartment was beautiful and the kitchen was well-equipped with everything we needed. The beds were comfortable; however, all members of our family found the pillows much too firm. Otherwise, perfect and I highly recommend it! Had three pleasant nights in the apartment. 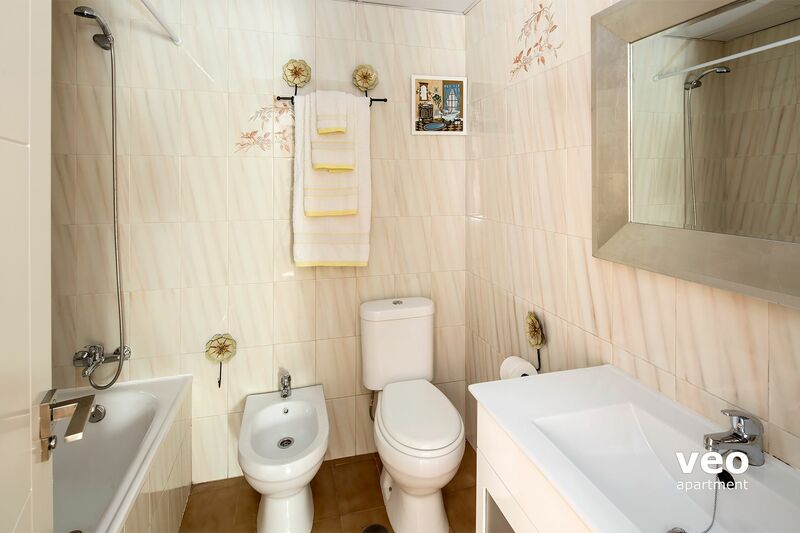 Fully equipped and great with two bathrooms, when six people are staying there. Rosa was very helpful, and even drove us to our car, so we could pick it up and park nearby the apartment. Very central location - would book again. For vacationers like us, the location of this apartment can't be beat! It's within very easy walking distance to all the major tourist attractions, but still quiet at night. The apartment itself was also very comfortable, with three separate bedrooms and two baths, as well as a cozy living room and and a fully equipped kitchen. Everything was super clean when we arrived. Maria and her husband met us upon arrival and spent quite a bit of time getting us oriented, which was wonderful and greatly appreciated. The one big drawback for us: Although the apartment building is generally quiet, the apartment directly upstairs was being remodeled during our stay, and the construction noise (and once, a tiny piece falling from the ceiling) rousted us out of bed early every weekday morning. Obviously, that's not a permanent problem, but it is worth asking about when you time your visit. Owner's response: Thank you very much for your comments. The apartment is usually quiet but the upstairs neighbor had a serious breakdown in the bathroom which is now fixed. Therefore the works are over. However, we apologise for any inconvenience caused, which as explained, was completely beyond our control. Best wishes. Excelente situación en Santa María la Blanca, zona bonita en pleno barrio de Santa Cruz. Tres habitaciones cómodas con buenos armarios. Propietario muy amable y acogedor. Estuvimos 3 días una familia de 2 adultos y 4 niños. "Excellent séjour dans un pappartement idéalement situé"
Appartement confortable permettant de séjourner à 5 personnes avec aisance ( 2 salles de bain et 2 toilettes). Cuisine bien équipée. Bonne Literie, vastes placards pour ranger ses affaires. Séjour un peu petit. Situation idéale dans un quartier très beau. Nous avons apprécié le calme. Nous sommes prêt à y revenir. Very good. The owners were very pleasant and actually met our taxi which was very helpful. The apartment is in an excellent safe quiet position. The only downside I would say is there is a lot of furniture in the lounge. The bedrooms and bedding were excellent. "A warm welcome and excellent location"
We had a very enjoyable stay. The kitchen had superb facilities and location was excellent. Muy bien equipado, excelente situación. Nos gustaría poder volver el año que viene. could not have asked for more.really enjoyed our stay in this apartment.so close to everything.apartment block is in private grounds and is kept so clean by a lady who appears to start each morning at 7.00am and does great work maintaining the communal areas. Mi valoración es muy positiva. 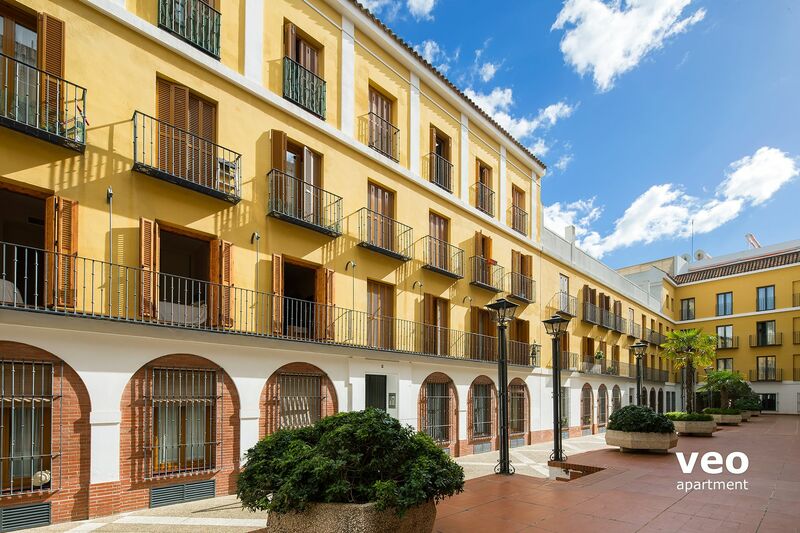 Es un apartamento muy cómodo, la localización es excelente ya que se encuentra en pleno barrio de Santa Cruz, a pocos metros de La Giralda. Tiene todas las comodidades necesarias. 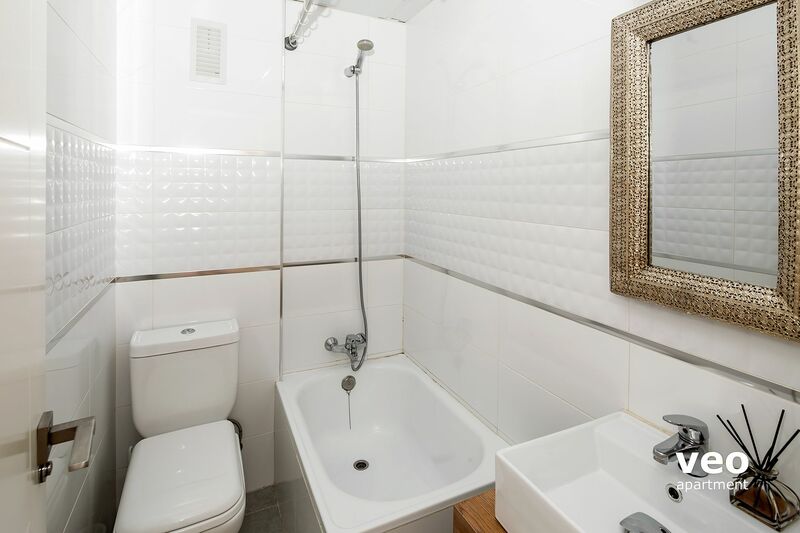 No es fácil encontrar un apartamento con dos baños completos y con dos camas de matrimonio, con lo que es ideal para compartir con amigos. Great apartment with an excellent location, just finding it by car was challenging, probably using the neighbouring hotel would be helpful to its location. A detailed description of how to find the apartment would have been very useful. Also need to note the absence of a kettle, which for us Brits and the need for a cup of tea led to us using a saucepan!! Apart from that the apartment is well equipped, although with plethora of restaurants to choose from we only breakfasted in the apartment, but it was a welcome refuge from the heat of the midday sun. Owner's reply: Thank you very much for your comments. We've bought a tea kettle as suggested and prepared an email with driving directions to send to our guests who arrive by car. Thank you for helping us to improve our services. Best regards. La situación inmejorable, MUY LIMPIO, la decoracion acojedora, comodo.......totalmente recomendable. La propietaria muy simpatica y con ganas de ayudar en lo que hiciera falta. El hecho de que los 2 baños del piso esten fuera de las habitaciones me parece un plus para ir 3 parejas o amigos en general. Me parece un piso para repetir, puede que en zonas del extraradio sean algo más económicos, pero la situación de este piso te hace no gastar nada en transporte. MARAVILLOSO!!! 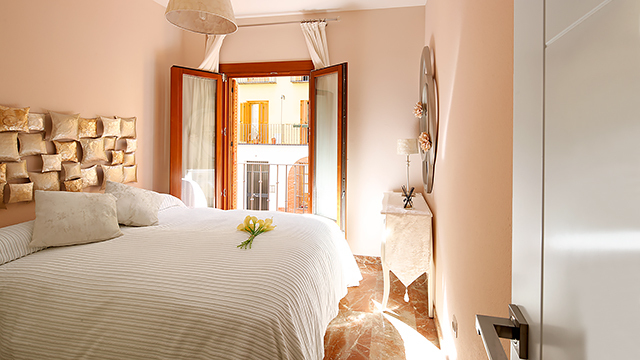 "Wonderful stay in Sevilla's Bario Santa Cruz"
We spent 5 wonderful nights in this lovely apartment. Rosa and her husband are very gracious hosts who make sure that you are made welcome at the start of your stay. The apartment is bright, clean, impeccably furnished. The kitchen is spotless and has plenty of dishes, utensils, pots and pans. We do not hesitate to recommend this apartment. Thank you Rosa for letting us use your beautiful apartment. 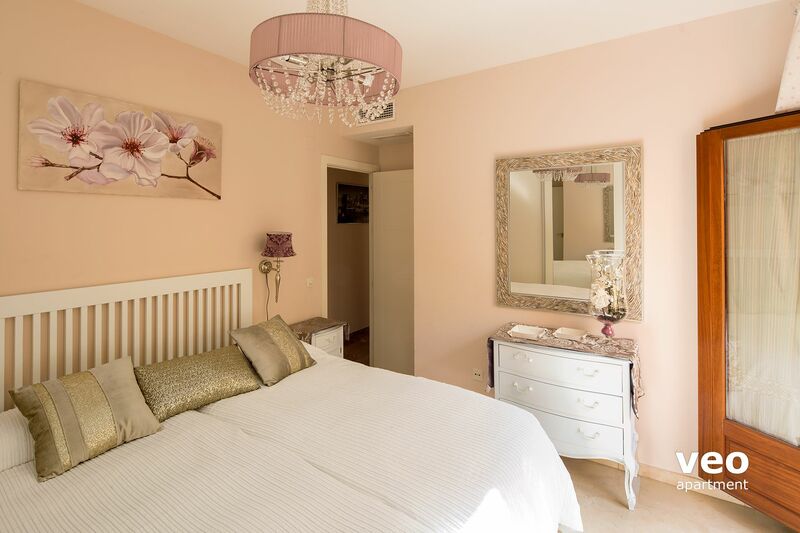 El apartamento es un encanto cerca de casi todo, tranquilo poco ruido muy confortable, bien equipado con todo lo necesario, los propietarios muy amables y dando todo tipo de informacion un 10 por todo, lo recomiendo, si regresamos a Sevilla sera un placer alquilarle de nuevo. Impecable: cuidado, con muy buen gusto, cómodo, silencioso, en pleno centro. "Bel appartement dans emplacement idéal"
Appartement agréable, clair spacieux et propre. Un seul défaut : loué pour 6 et seulement 4 chaises ! Todo nuevo y muy limpio, el emplazamiento en pleno Barrio Judio constituye su mayor valor. Ideal para visitar el centro de Sevilla. Además al entrar por un patio interno goza también de tranquilidad para descansar. Los propietarios atentos y muy amables, muy bien equipado.